The Birmingham Lions roared their way to the first ever Sapphire Series National Championship with an exhilarating 46-28 win over the Hertfordshire Tornadoes in the final. The Lions took the trophy for the first time after an incredibly successful first year of the Sapphire Series, with record numbers of , and women, participating. Birmingham entered the final tournament as the number one seed and faced a Derby team who managed to sneak into the national finals as the fourth seed. Ruth Matta scored the first touchdown in the battle of the North before a botched Derby handoff resulted in a safety, presenting Birmingham with an early nine point lead. Quarterback Jo Kilby hit Matta for her second touchdown before Emelie Taylor ran in to increase the lead to 22. Another Derby safety and Matta’s third touchdown of the half gave the Lions an insurmountable 30-0 lead going into the break. Derby continued to fight hard but after Laura Moore’s rushing touchdown, safety Nancy Stone stripped Hannah Odam to run in for yet another defensive touchdown for the Great Britain running back. Emelie Taylor put the final nail in the Braves’ coffin with a late touchdown, sending the Lions to the national final on the back of a 50-0 shutout win. Meanwhile on the other pitch, Hertfordshire and Kingston took to battle once again in what is shaping up to be one of, if not the fiercest, rivalries in the women’s game. Sabine Odfjell put the first points on the board on Kingston’s opening drive with a powerful run. This semi final had a palpable tension about it which only grew with each crunching hit. Following a big sack, Tornadoes quarterback Sarah Glassborow fired a bomb into the Kingston end zone, finding receiver Jess Anderson to create a 7-6 lead. But it didn’t last long, as Helena Barikmo’s touchdown catch swung the lead back over to the Horse. Jess Anderson’s catch and fumble was recovered and taken in for a touchdown by center Amy Schiller, but was called back for holding just before the half, preserving Kingston’s 12-7 lead going into the half. Following the break, Glassborow hit Hollie Whiting and Amanda Casey on consecutive drives for touchdowns, but couldn’t convert either point after attempts, leaving the door open for Kingston, now just seven points behind. The final twist of the game came as Barikmo added her second touchdown of the game in reply to set up an overtime showdown for a place in the National Championship game. Hertfordshire were the first up, but fired blank on their attempt. Kingston couldn’t capitalise as the game headed to second overtime. As the pressure grew, so did the quality of the defense as both teams failed to convert on their second attempts, forcing triple overtime. But third time was a charm for the Tornadoes as Glassborow found GB player Amanda Casey, meaning Kingston had to score or would face defeat. It looked like they would force quadruple overtime until Charli Norman’s emphatically broke up the pass to close the door on Kingston’s title hopes, sending the Tornadoes sideline into a state of euphoria. The stage was set for a Hertfordshire – Birmingham national final, but first Derby and Kingston battled it out for the bronze medal. The Horse ramped to an early 19-0 first half lead which included an extremely well executed Miriam Hansel receiving touchdown. As the crowd got behind the underdog Braves, Kingston continued to pile the pressure onto Derby, who continued to show a unique never say die spirit as a true success story of the first season of the Sapphire Series. After the second half, Kingston’s bruising defense added a safety before Alessia Nava’s touchdown put the cherry on top of an impressive 29-0 victory to seal a third place finish for the London side. The attention of those in attendance and those keeping track via social media at home turned to the National Final, as the Hertfordshire Tornadoes looked to take down the number one seed Birmingham Lions. The game starting out at a lightning fast pace, with Emelie Taylor scampering in to give Birmingham the early advantage. The Lions doubled their lead on the next drive, as Nancy Stone once again recovered a fumble and returned it the short distance for a touchdown. The Lions intercepted Hertfordshire deep in their own territory on their next drive and Laura Moore made them pay for it as the Lions stormed to an early 21-0 lead. But Hertfordshire weren’t going to give up that easily. After a great catch by Hollie Whiting, Glassborow found center Amy Schiller for the touchdown to ease the deficit. The scoring bonanza continued when Moore added her second rushing touchdown, only for Schiller to follow suit on the very next drive with her second receiving touchdown. The Lions and Tornadoes managed to find their ways into the end zone again before the half. Jo Kilby showed off her cannon arm, putting the ball on a dime for Ruth Matta’s first touchdown of the game. Hertfordshire, as they had developed a tendency to do now, replied straight away, with Glassborow’s third passing TD of the half, this one to Jess Anderson. The half time break gave both teams a chance to recover from the 34-20 slobber knocker, with message from both camps being that the game is far from over. After the 54 point first half, both defenses were intent on proving their potency as the second half started off with a three drive scoring drought. Kilby and the Lions offense put the game to bed with their second passing touchdown of the day with GB center Michelle ‘Deli’ Gwynne getting on the scoreboard. One final Glassborow touchdown ended up being a consolation score as the Lions ran out 46-28 winners, becoming the first team to hoist the Sapphire Series trophy. 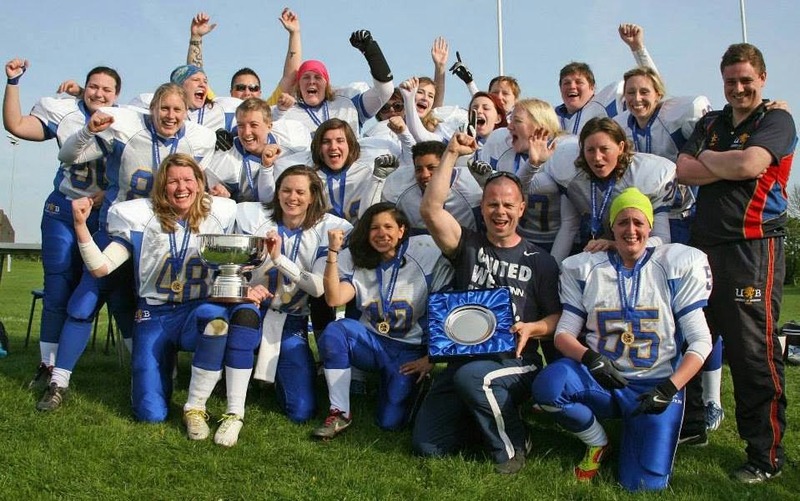 You can get involved in Women’s American Football by attending our Development Days happening throughout the summer, where you will learn the basics of American Football and be able to get a taste for one of the fast growing sports in the UK. The days are open to all 18+, any skill level welcome!